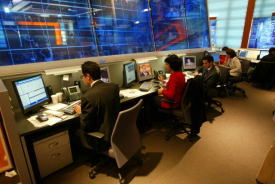 I came from a TV newsroom into the world of inbound marketing. After almost a decade in the newsroom, I have more than a few stories. One thing I want to do is offer inbound marketing lessons from a TV newsroom. This should help show businesses that a journalist just may be the right fit for a marketing department. It will also show journalists that there’s more to life than the newsroom. Stop and think about it. You probably ask yourself some variation of this question when watching the news. It’s depressing, it’s all negative and it just bums you out. But here’s the secret: bad news sells. People may say they want to hear good news and they’re tired of the negative, but the most viewed stories online (where we can actually and accurately track views) are the bad news stories. We want to know the bad guys got caught, so we read about the murderers, molesters and thieves. We want to know if we know the person in an accident. We migrate to the macabre. And with technology today, we can know this without a doubt. Herein lies the inbound marketing lesson from the TV newsroom. No matter what people tell you they like or their habits, test their actual behavior. For instance, what kind of call to action (CTA) would you click on a website? A green button that says “Free Guide Here” or a red button that says “Free Guide Here”? You may say you’d click green, but the numbers may show the red one to more popular. This is why A/B testing is such an important part of inbound marketing. A/B testing in itself is a pretty simple idea. You present your audience with 2 choices. As in the example above, it’s the red button. “Free” is a popular word in email subject lines and on CTAs. But some research has shown that the word free actually drives less traffic than an action word like download. In your business, the golden word may be free and the color may be green, but if you don’t test it and track it, you’ll never know. Some software like HubSpot allows you to A/B test things like calls to action. Other tools allow you to test email subject lines. But even if you have to set it up yourself, testing is vital. Let’s look at email subject lines. If you had a list of 1,000 people you email, you could send an email to a small portion like 100. Email A might say “Download Your Free Coupon for Our Widget” and email B might say “Widget A Solves Your Hair Loss Problem.” Send each one to 50 from your list of 100, and whichever line gets the most clicks or opens, you know that’s the kind that resonates with your audience. Just as with the negative news question from TV viewers, we all think we know what works best and what we want. But at the end of the day, our behavior is the only true metric that matters. As an inbound marketer, it’s vital to test everything you can to find out the best or most efficient way of doing what you do. Test everything: it’s today’s inbound marketing lesson from the TV newsroom. If you like what you’ve read, please share on Twitter, LinkedIn, Google+ and Facebook. And subscribe to the blog over on the right side of the screen. Cheers! This entry was posted in inbound marketing and tagged inbound marketing, marketing, marketing lessons, marketing metrics on March 4, 2013 by danmoyle. Great thoughts Dan. Always be testing! Your thoughts reminded me of the hours I spent on my first Landing Pages. They were things of beauty with copy, pictures and trust seals. Then I saw what you had done on the AmeriFirst site – clean, short and direct…plus your conversion rate was 3x higher. When I tested both designs, I found my visitors like your style better. Tim Ash summarized it this way at INbound 2012: A/B testing is asking your visitors what they like best, then listening and implementing their answer. Thanks for the insights Tom. Listening and implementing is the perfect follow up to testing. Glad to know we could inspire some success out there with landing pages! Maybe that should be my next article! Cheers friend.